We’re taking a tasty tour of Vancouver’s many brunches to create The Ultimate Vancouver Brunch Guide. 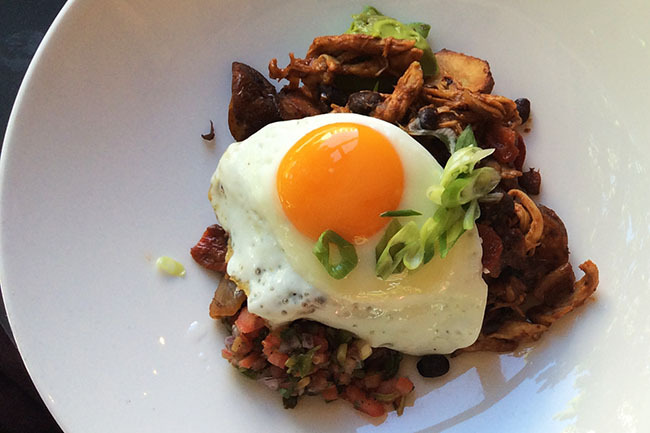 This week we’re in Gastown for a spot of weekend brunch at Chill Winston. Located on the edge of Maple Tree Square, Chill Winston is the perfect place to relish the vibe and vibrancy of Gastown. Indeed, during the week Chill Winston is a favoured gathering spot for lunch, dinner and drinks, thanks in large part to the restaurant’s delicious food choices and unbeatable location. In addition to their weekday service, Chill Winston also pulls a crowd for their late morning weekend brunch. Boasting an expansive sun-drenched patio it’s no wonder that Chill Winston is an incredibly popular eatery to visit. 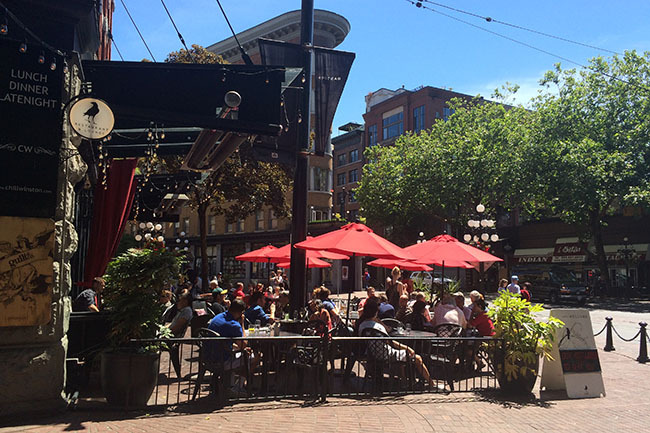 With over 100 seats Chill Winston’s patio is a fantastic place to sit and soak up the summer rays as well as enjoy a delicious, lingering brunch. Unlike other brunch establishments in the city that list an overwhelming amount of food choices, the brunch menu at Chill Winston is short and sweet. There are six items to choose from, each one as tempting as the next, including Eggs Benedict ($16); Chicken Hash ($15.75); Kale and Eggs ($15), and more. Brunch goers who enjoy beginning the day with something sweet should not miss out on Chill Winston’s Crème Brûleé French Toast ($12). 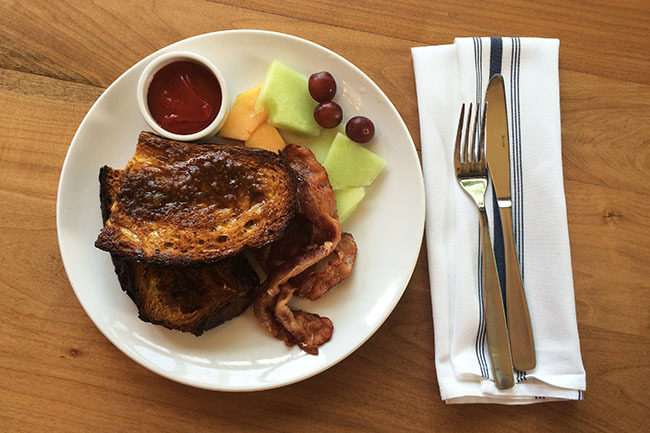 Consisting of two thick slices of Grand Marnier infused artisan bread (baked and caramelized), and served with house-made orange marmalade, syrup and fresh fruit, Chill Winston’s French Toast is like no other. Yes, the French Toast is sweet, but delightfully so. The bread is wonderfully dense and absorbs all the sugary goodness from the syrup and fruit-based preserves. If the ratio of sweet to salty is a little too unbalanced for your liking, do what the menu suggests and add-on some protein. A side of salty sizzling bacon is recommended. While the brunch menu is decidedly concise, patrons have a lot of freedom when it comes to choosing sides and add-ons. Add-ons include: avocado salsa; olive tapenade; house-smoked cheddar; bacon; sausage; turkey; prawns, and more. There are also a few lunch plate options too — that is until 2 p.m. when the full lunch menu becomes available. From the bar, patrons will find a variety of non-alcoholic and alcoholic beverages. 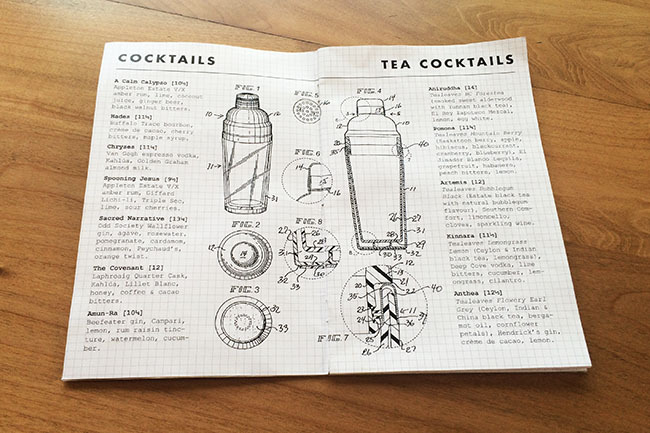 Drink menu highlights include the restaurant’s Tea Cocktails, which when requested make ones brunch order complete. For a refreshing summer sipper try the Kinnara ($11.50), a light and fruity drink made up of Tealeaves Lemongrass Lemon (Ceylon and Indian black tea, lemongrass), Deep Cove vodka, lime bitters, cucumber, lemongrass and cilantro. While most visitors to Chill Winston want to recline on the sprawling patio, the restaurant is also home to a beautiful indoor space. Nothing is lost by sitting inside; it’s cool, comfortable and the ideal spot to retreat to when the temperature hits the high 20s. Friendly and attentive service, a vibrant yet laid back atmosphere, creative (boozy) morning cocktails, and an uncomplicated menu make Chill Winston an excellent weekend brunch choice.